Site Name: A name for your company locations that will support users or components. By default, PureCloud takes advantage of an adaptive voice codec, OPUS, between the Edge and phone endpoints for voice traffic. As OPUS is an adaptive codec, it automatically adjusts the sampling rates as network conditions vary. Our engineering team recommends that customers allocate 32 – 128 Kbps of bi-directional network voice bandwidth per expected/supported concurrent call. The more network voice bandwidth allocated to calls, the higher the sampling rate, thus the higher the quality. In addition, you must allocate bandwidth for SIP control traffic. We recommend that you allocate 5% of the high voice bandwidth value for SIP. Note: For sites that handle customer engagement and business critical calls, we recommend the best practice of allocating high voice bandwidth to ensure the best audio quality. To connect the Edge to a PSTN provider, you must establish an SIP trunk between the Edge and the provider’s termination point. When building a SIP trunk on the Edge, you have to use the G.711 codec for the voice traffic. Using G.711 requires that you allocate 90 Kbps of bi-directional network voice bandwidth per expected/supported concurrent call to the PSTN. In addition, you must allocate bandwidth for SIP control traffic. We recommend that you allocate 5% of the voice bandwidth value for SIP. 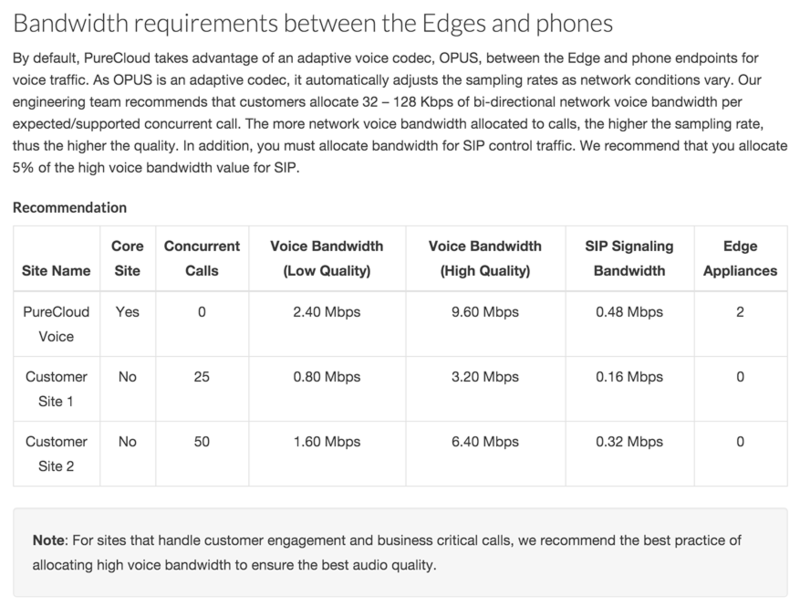 In addition to voice and SIP traffic for phone calls, the Edge also takes advantage of connectivity to the Internet to reach the PureCloud service. The Edge uses Internet connectivity for three major purposes: to synchronize the configuration of the Edge with the cloud, in synchronizing the status of phone calls between the Edge and cloud, and to store call recordings. To address the Edge synchronization needs, we recommend that you ensure you have a minimum of 15 Kbps of bi-directional Internet bandwidth available and an extra 10 Kbps per 50-expected/supported concurrent phone call. Internet bandwidth needs for the upload of recordings is more variable based on the number of concurrent recordings and the length of the recordings. To account for this variability, we recommend that you allocate 64 Kbps of outbound Internet bandwidth per expected concurrent recorded phone call. By default, the PureCloud Edge marks all voice and SIP network packets with the following Quality of Service DSCP values.